As the skin ages, the cells within the skin don’t function uniformly or as optimally as they did when you were younger. The amounts of substances such as collagen and elastin, which make the skin plump, decrease with time. Chemical peels exfoliate a fine layer of dead skin cells from the surface, thereby stimulating the underlying skin cells to function better and more evenly and your skin becomes healthier, fuller and more hydrated from the inside, out. 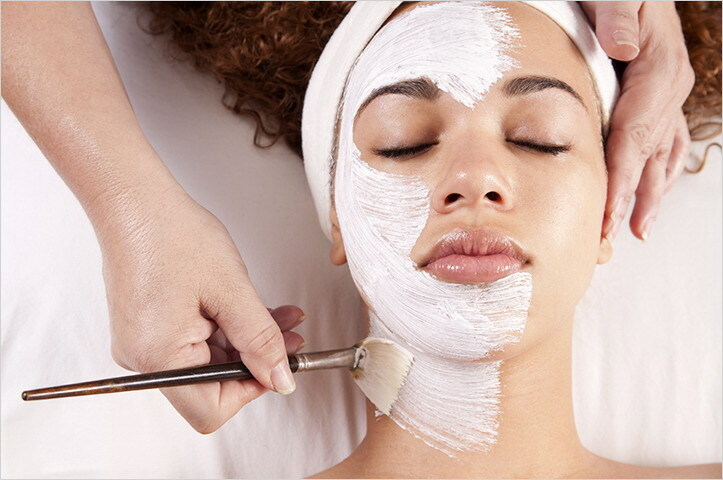 Chemical peels leave the skin feeling clean and supple. A course of approximately 6 treatments is required for more dramatic results. After the treatment, a unique set of antioxidants are applied to the skin, followed by a high-quality sunscreen. * Prices quoted are for full face only, unless otherwise specified (but are size dependent). Additional areas can be treated and may be subject to further costs. SkinCeuticals Facial Treatments use pharmaceutical-grade treatment products that can be targeted to your skin’s precise needs. They also enhance and maintain the results of your at-home products and other professional procedures to optimise the health and beauty of your skin. We offer an extensive skin analysis using a Woods Lamp, which will look at the overall condition of your skin, as well as highlight any problematic areas. This enables us to formulate a treatment and product list exclusively for you, so you achieve maximum benefit. Ideal for dehydrated, ageing and environmentally damaged skin types who want to give their skin a well-deserved circulation boost. The use of specific cleansing, toning, masque and protective products will help to add a healthier, firmer appearance to the skin. This facial is perfect for anyone experiencing congested pores (including teenage skin). The combination of products helps to reduce oil without drying and gives the skin the hydration it needs. This treatment is designed for acne-prone skin. It includes a calming masque and lymphatic drainage, as well as corrective products ideal for the treatment of acne. This treatment is designed for acne prone skin but is combined with an anti-ageing treatment. It is a treatment protocol of six sessions to see the best results. Skin is left hydrated and calmed by using a combination of masques and antioxidants, which draw out the impurities and stop bacteria spreading. This treatment is designed to help soothe and calm sensitive skin. Redness Neutralizer prevents and controls the inflammation cascade, reduces erythema and flushing and provides soothing, cooling relief. This treatment is designed specifically for men who suffer from ingrown hairs brought about by shaving. Three different types of treatments are included to combat the signs of skin ageing, increase the hydration of dull and tired skin and increase skin circulation and cell renewal. To stimulate the skin to perform at its optimum, Fourways Aesthetic Centre employs a revolutionary new device – the Dermapen®. Dermapen® is a fantastic alternative to laser skin rejuvenation and has been voted Best Professional Skin Rejuvenation Device at The Aesthetic Show by a panel of US aesthetic centres and dermatologists in 2012. This is a microneedling device that creates microchannels in the skin. These channels stimulate naturally occurring growth factors, which leads to your skin producing more of its own collagen. In addition to these benefits of the microneedling alone, these channels allow for the accelerated absorption and direct action of potent products to the skin. This further aids the treatment of individual areas of concern such as pigmentation, UV damage and cancer prevention. Dermapen® is a focused device that works in a vertical motion, thereby also resulting in faster healing. Recommended number of treatments: 4 – 6 (every 4 – 6 weeks). Although individual results may vary, these can often be observed as soon as the first treatment. Home care is a vital step to maintaining your skin’s results after procedures and preparing your skin for further treatments. When you visit us, we shall discuss with you the vital steps for your skin care routine, and the right products for your particular skin concerns. All skincare ranges at Fourways Aesthetic Centre, are only available at doctor’s offices because of the active ingredients contained therein and are considered medical grade.